Do you have an online business and you are not sure where to start with using social media to market? Try downloading this quick reference guide to help you get started. This is a basic guide to making sure you are setting up the right accounts and quick tips on how to use each for marketing. This is marketed on TeacherPayTeachers.com, but is great for any business. 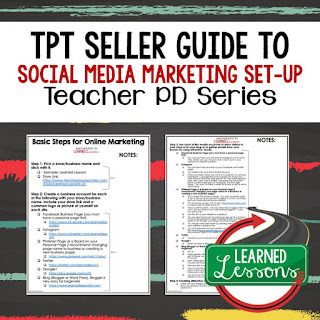 As a TpT Seller, the best thing I ever did was get my social media and marketing plan together. At first, it was overwhelming, but hopefully this step-by-step guide will help you to better market your business using social media. This is a simple start-up guide that gives an overview of how I set up my own successful platforms. It had made a difference in my business and has kept everything streamlined. Enjoy! Note: This is also a great social media set-up guide for any small business or to use with a school's social media platform. For my blog’s SEO campaign, I had had a freelancer and he wasted almost 6 months and later on I came to know that he was not doing what I needed for my blog. So I replaced him with the expert services offered by renowned seo company Los Angeles. Truly I am very satisfied with the way this team is working to bring best results.